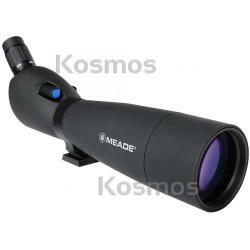 20-60x80mm Wilderness Spotting Scope, Kosmos Scientific de México, S.A. de C.V.
Meade high-quality, 20-60 power, zoom porro prism binoculars deliver years of use. Large 80mm objective gathers plenty of light for bright detailed images. All Wilderness spotters feature high index BaK-4 prisms and high-quality, precision ground lenses that are coated with multiple layers of anti-reflection coatings to provide optical performance that is equal to, or better than any spotting scope in its class. Each Wilderness spotting scope features a sliding sunshade to further reduce glare. A rugged rubber armor covering protects your Wilderness spotting scope from abrasions and damage from regular use. All Wilderness Series spotting scopes are waterproof, fog-proof, and nitrogen purged to ensure many years of performance regardless of the environment. All Wilderness spotting scopes come standard with the soft case and camera adapter (requires T-Mount, not included).